Tanorexia is a tanning addiction, obsession with sunbathing in the summer, even without protection, and in UVA rays in winter. Tanorexia affects people who cannot conceive a lower tone than they already have. The consequences of tanorexia can be fatal to skin health. In times of heat, we all like to sunbathe to get brown. But be careful with obsessing in summer with tanning as it can lead to disorders such as tanorexia. What does this disorder hide? What effects can it have on health? Tanorexia is a body dysmorphic disorder, an alteration in the perception of the own image, a point in common with other disorders such as anorexia. Very critical with its physical appearance, this gets to see your skin too white, when in fact they are excessively dark. For sun-addicted to be brown is synonymous to feel more attractive, but in reality it is never enough and are exposed to sunlight at all hours during the summer and, if not possible, resort to the UVA rays. Exceeding with artificial tanning implies as much risk to the skin as it does with the natural tanning. 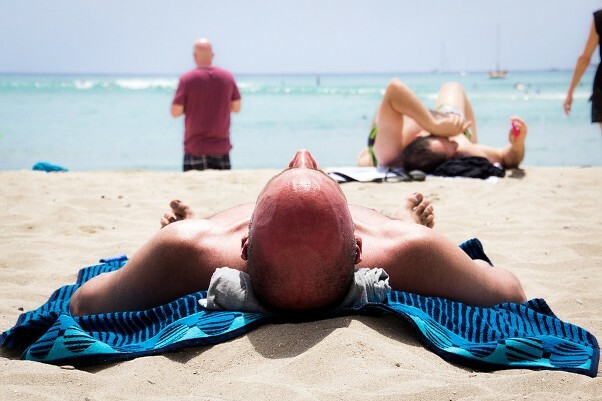 A study by Wake Forest University (USA) in 2006 showed that dependence is triggered by the release of opioids and endorphins while sunbathing, the neurotransmitters of the pleasure, which leads to excess hours sunbathing to become addictive, one of the worst for the health of the skin. Signs of premature aging of the skin due to excessive exposure to the sun. Appearance of dry and rough skin. Most pronounced lines of expression. Rough skin in some areas. He always thinks his skin is too pale. He continually compares his tan tone to that of the people around him. He comes too often to tanning centers. Lack of sun exposure can lead to loss of appetite and nerve attacks. Anxiety and increased risk of depression. Increased risk of skin burns. Increased risk of vision problems. Go to the dermatologist to know the risk of our skin and the type of protection depending on the phototype. Take the sunbathe gradually, starting for a few minutes during the first few days. Monitor any permanent alteration of the skin. Use a cream after sunbathing for sun damage repair. In the treatment of tanorexia the psychologist and the dermatologist must intervene. Psychological treatment: Therapy to prevent the patient continue sunbathing indiscriminately, working also correcting the perception of body image. Dermatological treatment: Treat the changes caused by excessive tanning. It may be necessary to resort to the skin regenerators, topical treatments and, in the most severe cases, against cancer.